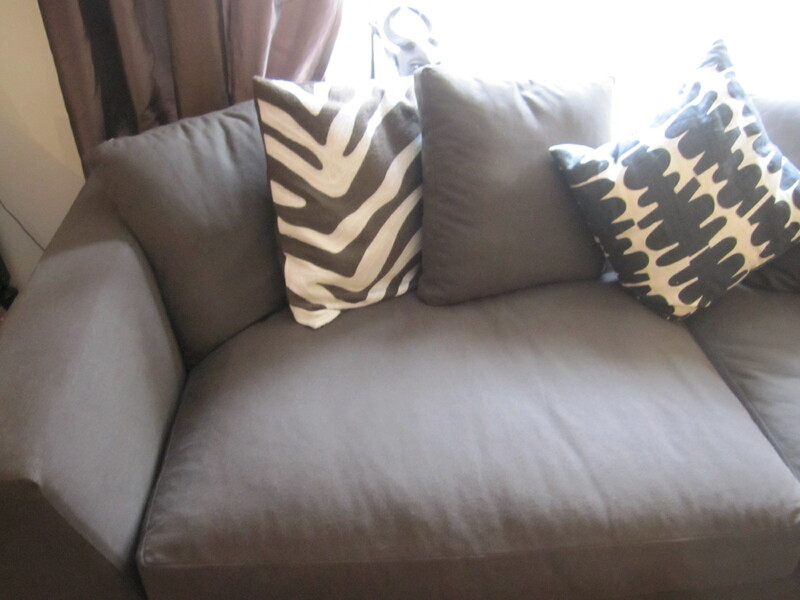 Sofa Saga, Part 5: A Happy Place to Sit | Laura's "Rules"
Everyone, exhale. 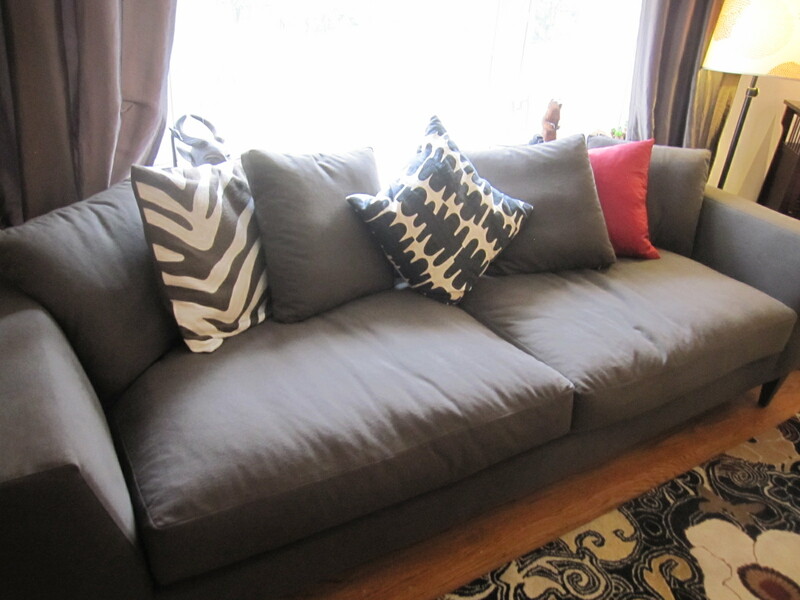 Our (cleaner, greener) sofa has finally arrived! I was very concerned that after all these months of anticipation, it would not measure up. 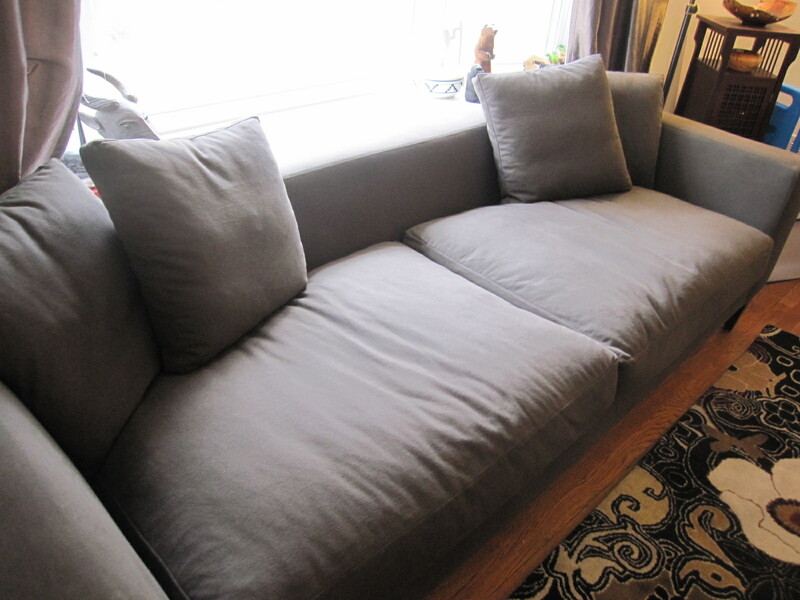 But it is well-made, truly comfortable, roomy and fits my living room like it was made for it. Which it basically was. Going couch-less was not easy. With this dark period now behind us, we can breathe a sigh of relief, fuss a bit over the cushions, and celebrate the close of our odd social pariah status. No longer will we have to burden casual visitors with an alarming earful concerning how and why I put my toxic Ikea sofa out on the curb, just to address the paucity of seating options. We ended up with a couch from Robert Craymer, who had great designs and gave us a price break even before this blog started sending traffic his way, as I explain here. It was a long wait, although some of the delay was my responsibility as well, as I contemplated the materials, color, etc. Robert’s recently down-sized his operation and closed his storefront, and, as he told me, he’s happy to do orders, but they will take some time to fill. Happy thanksgiving! This year, we’ll be thankful for furniture that doesn’t add flame retardants to our house, and is lovely to sit on as well. And here’s sobering coverage of a study released Nov. 15, 2012, linking maternal-fetal levels of PBDEs, a particular and ubiquitous flame retardant found in 97 percent of the study subjects, to delayed development in the child at age 7. There’s more! Coming attractions include a guest post by Ken Fonville, of Eco-Select Furniture, with an update on the California process from his perspective. Full disclosure: I have not been paid any commission whatsoever by either company for this review or any other post, but Robert did rather casually mention that he might send along some additional pieces given the referrals he’s getting from the blog mentions. Lucky me! This entry was posted in Environmental Health & Safety and tagged babies, baby, Business, California, chemicals, comfy, couch, eco-, environmental health, Flame retardant, flame retardants, furniture, green, health, healthy, Home, Ikea, latex, living room, mommy blog, organic, parenting, PBDEs, Polybrominated diphenyl ethers, polyurethane, safety, seating, sofa, toddler, Toxic, toxic chemicals, toxics, uncertainty by Laura MacCleery. Bookmark the permalink. I honestly can’t recall when I last posted, but feel a need to do so again with my impressions of latex as a cushion. In an all out effort to reduce the amount of chemicals in my home, as well as meet the needs of my arthritic bones, aching FM muscles, and a host of other issues – well I went for latex. I bought a latex mattress, lots of wool and a latex topper. Then I purchased yet another twin set and built a daybed for the living room, no ordinary sofa here. I see why many manufacturers are saying clients find it less comfortable. Although perhaps the inclination to always use the same ILD on most everything could be part of the problem. I did visit a couple of showrooms and gave sofas the ‘sit test’, but found the seats too hard. Latex is good stuff, but it’s not for everyone. I love the daybed instead of a sofa, it suits our lifestyle and family situation to a ‘T’. It looks great and is totally natural, washable covers and pillows as well. The latex on the other hand is slated to go on all counts. Why? Well it doesn’t stink, but it has a ‘push back’ action that creates pain. No matter what or how I shift, it’s short term only. My husband thinks I have developed a spring in my backside, can’t sit on it for very long and have to get up. Recently I traveled for a month and never mind the nasty chemicals that were in the beds – all were innerspring and I rested, even on the hard ones. Sofas were comfy and most of the chairs were as well. In an effort to clean the air, I emptied the bank account and created more pain. It’s nearly impossible to test anything made of ecologically friendly material. It’s nearly impossible to tell whether or not that polyfoam will make you sick regardless of FR;s – but there does come a time when the art of compromise has to be considered. A good air purifier, organic bedding, and a need to clean regularly are back to the tops of the priority lists. The cushioning is still an item of great concern in this household. Are you concerned with lead or cadmium being in the leather of Eco-Select furniture? When I asked Ken about this, he didn’t seem to know. He only stated that it’s the best leather that uses the best environmental practices. Any thoughts? http://www.bloomberg.com/bw/articles/2014-11-13/bangladesh-leather-industrys-workers-exposed-to-toxic-chemicals When articles like this expose the conditions of workers and the mess of chemicals getting into the environment in places where there is no recourse for putting profit ahead of all else, it pays to know where your raw materials come from. Nobody interested in our furniture or that from Eco Select would want to support reckless destruction of our environment. Here’s some good news — according to this study (http://www.nrdc.org/health/flame-retardants/files/safer-sofas-FS.pdf) Crate & Barrel is offering FR-free couches now. I followed up with two different customer service folks yesterday to try to verify. My current understanding is that all of their NEW/2014 items are completely FR-free. Dianne: Hi there! I’d be happy to help you today! Dianne: All of our upholstered sofas and chairs no longer have flame retardants. Dianne: I am sorry for the confusion. All of our products that have been produced in 2014 are flame retardant free. If you purchase a floor model or an item in our outlet store, the item may still have the flame retardants. You: okay, thank you. and just to verify — 100% flame retardant free, including the fabric and the cushions? Dianne: The poly foam in all of our items produced in 2014 do not have flame retardants applied. You: okay, thank you. do i need to select certain fabrics to ensure there have been no flame retardants applied, or area all the fabrics also un-treated? Dianne: We have never applied flame retardants to any of our fabrics. Dianne: Flame retardants were only applied to the inner cores of the cushions. Dianne: Do you have any further questions I can assist with? I would like to find out the source of the foam Crate and Barrel uses because from what I have read Centipur is the source of all of the foam and they still make it with flame retardants in the foam. Also, part soy means nothing when the other part is regular foam. Thank you for contacting IKEA. Although we do our best to respond to all emails as quickly as possible, due to such high demand, it is possible to experience a delay. We apologize for the untimely response, and we thank you for your patience. Today, all IKEA furniture complies with existing regulatory standards in the US, including California TB117. IKEA welcomes the new TB117-2013, which will allow us to manufacture upholstery products that meet the fire safety standard without the addition of chemical flame retardants. As with any change in legislation or standards concerning our range, IKEA conducts evaluation, adjustments and testing of our products according to new requirements. Affected IKEA products will be in compliance with the requirements in the new California TB117-2013 Standard on January 1st 2015 at the latest. We hope that this information has been helpful, and we thank you for giving us the opportunity to assist you. Seems like good news for those of us on the search for chemical-free furniture! I was just wondering if there was any new information out there on other companies. I have tried to contact Rowe furniture to see what was inside their cushions but have not received a response. I spoke today with someone at the Ikea customer service line. They plan to discontinue the use of flame retardants in their upholstered furniture in 2015. Crate and Barrel has several options for upholstered furniture without flame retardants, but I had to talk to many people before finding someone who could provide this information, which is not listed on their website. I had to provide the woman with a list of pieces I was considering, and she confirmed which ones were available without flame retardants. When I order, I will have to specify that I want the piece without flame retardants. Otherwise, the chemicals will be included. The woman’s name is Kristy and she can be reached at kmette@crateandbarrel.com. She works in the office of the CEO and is quite friendly, speedy, and helpful. I just found this blog. I’m looking for a new sofa and chairs and a mattress and box spring. I have become afflicted with MCS after sitting in my leather recliner with a heating pad on my back and went to sleep. The heating pad got too hot and set off a chemical reaction with the fire retardant in the chair. Now, a year later I am finding I have become sensitive to the fire retardant in my furniture, causing physical health problems. I have gotten rid of the chair and am giving away my very large and expensive couch and another leather wing back chair. I can smell the fire retardant materials now day and night and makes life very unpleasant. I must act on purchasing new furniture and the information on your blog has been very helpful. Still it raises more questions. Am I also allergic to the plastic foam in the furniture or just the fire retardant? Keep up the good work. I find your blog very informative, although I am quite a lot older than those of you who are raising young children. Thanks much. Do you know anything about the reliability of either of these two places that offer testing for consumers? I really want to believe these are legitimate but I’ve read in other places that the average person can’t send in samples to get their household items tested – that’s it’s not available at the consumer level. Pingback: Toxic Hot Seat on HBO tonight! | Laura's "Rules"
THANK YOU for all the work you’ve done on this, Laura. Ever since my husband I’m in the process of trying to track down a non-cancer-causing couch, and your site has been a godsend. 1) I’m in Austin, TX…and I’d love to buy local if at all possible. You haven’t run across any good local options in TX, have you? In the meantime, I’m going to reach out to Robert Craymer and Endicott to see whether they’ll ship here, but I thought I’d ask just in case. 2) Now that California has changed the requirements (!!!!!!!!!! 🙂 🙂 🙂 ), do you (or the glorious sources you’ve drummed up over the course of the Sofa Saga) have any thoughts on when we’ll be able to expect broad abandonment of flame retardants in mass-market furniture? Again, thank you. Also, I LOVE that you’re still actively responding to questions and comments, over a year later!! I’m in Austin TX with a new baby, new house & looking for a new sectional & other non toxic furniture….. Know of any place good? Hi Laura, Thanks for a terrific blog. My wife and I are desperately trying to figure out what to do! Our couch is definitely at least pre-1980ish, purchased at Merchandise Mart in Chicago. It is old enough that it has a tag on it (under cushion area) that says, “Keep your furniture and family safe from fires caused by careless smoking. Do not smoke when drowsy. Remove immediately any glowing ember or lighted cigarette which falls on furniture. SMOLDERING SMOKING MATERIALS CAN CAUSE UPHOLSTERED FURNITURE FIRES.” There is no indication about what the couch is made of, however. Thoughts on likelihood of fire retardants or scary chemicals? Our Crate and Barrel chair says the seat body is made of “urethane foam” (90%) and polyester fiber (8%) and “blended cotton felt” (2%) and that the cushion is made of “urethane foam” (80%) and polyester fiber (20%) but it has no TB 117 tag (purchased in Chicago in 1996). What do you make of that? Laura, have you read the ripoff report on this Robert from whom you purchased the couch? Looks like he’s running a scam. Some folks purchased a couch from him and had it tested, and it was full of chemicals. Thanks for sharing your research and experiences, Laura. I had also been very concerned about these issues when looking for a sofa nearly 2 years ago. After several months, I found EKLA Home, and the whole family is very happy with our “Tom” style sofa, which we’ve had for 16 months. It’s still beautiful and comfortable and solid and free of the many sources of toxins which seem to fill and coat the typical sofa. Emily Kroll, the founder, took lots of time explaining the ingredients and their processes, and I felt in good hands. Great to hear, thanks for sharing! Thank you for writing about this important topic! I, too, have been on hunt for an affordable, stylish, FR free sofa and your blog has been a huge help. I spoke with Robert Craymer the other day and I am considering having him build our new couch. Are you happy with your beautiful couch? How is the construction? Is it comfortable? It has been about 5 months now and how is it holding up? Since I am in PA and can’t go “see and sit” I would love to hear how your experience went and how your couch is doing! Thank you again and I look forward to more of your wonderful posts! I just want to share with you and your readers that EKLA HOME is running a sale through April 21, 2013 on its TOM sofa in 78″ and 90″ with four fabric options. The details are in the following link. As you already know, EKLA HOME uses certified organic natural latex rubber, certified organic wool batting, certified organic cotton muslin, no V.O.C. stains, FSC-certified solid alder hardwood and recycled steel. The 78″ TOM is $1995 plus shipping and the 90″ version is $2200. The upholstery fabric option is Winthrop from OecoTextiles. This is a great opportunity for your readers to get a completely non-toxic sofa with all of the certifications for our ingredients. We are happy to answer questions that are not covered on our website and people may contact us at info@eklahome.com or 310-699-9057. I read the comments about foam (polyurethane vs latex) and researched online and it is hard to get a clear answer. We have a natural latex bed and pillow and there is a smell. We actually don’t use the pillow because I don’t like the smell by my nose. We are getting ready to order a new couch without flame retardants but I can’t decide on the foam. Some say that polyurethane offgases and disintegrades over time and gives off bad stuff but others say it is harmless. I know you do your research and you went with polyurethane and I am leaning that way. Did you find that there were any harmful offgassing/dusting with polyurethane? Hi there, I think this is a hard question to answer, as you found. There are certainly troubling chemicals in polyurethane, such as toluene, and we know chemicals don’t stay put (i.e., if flame retardants are in the dust from the foam, I imagine the other things are too, though I have not seen research on this). So I felt torn — you have this problem over and over again of people focusing on one problematic chemical, like BPA, only to overlook the problems with the substitute, and no one likes to feel a dope about that sort of thing. Given that I know what foam feels like and find it comfortable, and that it doesn’t smell, and that I would not have a chance to sit on or smell the latex option first, I went the safer route, in my view. Whether it will turn out that I’ve been silly — i.e., taken out FRs but left in other damaging chemicals — is, I fully admit, a risk, which is why I have always pointed to the discussion of the issue in the various comments. In terms of our sofa, I have not noticed anything unusual, but I really could not say whether our household dust is safe, of course, without tests. No smell either. It is comfortable. I am waiting to hear a little more from them, but their prices seem pretty low. When I tried to call the number on their web site last April, it was disconnected. I agree about their prices– did you speak to a person there? I’m also a bit confused because they are based in California so I’d be curious as to how they deal with the state law. Please keep me posted! My reply: Dear D, Hi there! Just so you know, I will add your question in the blog comments anonymously, so that other readers can benefit. I don’t know about the details on this onw, and have no other comments on them on the blog. Do they sell furniture in California? It seems to be that companies that do all have FRs in them; companies that sell only locally or regionally may not. So it may be fine. I am certainly reassured by the fact that they use down, rather than foam, and untreated fabrics. I think it sounds promising. One step for extra safety may be to ask for reassurance in writing that there are no FRs in the furniture. This puts companies on the hook a bit more under truth in advertising rules, which are really the only way any of us know what is in anything. Other than that, we all basically have to take the word of the company. It’s certainly a plus to be able to see what you are paying for! Thanks so much for writing back! I had emailed Drexel Heritage’s corporate office a couple of days ago and received a reply back this morning. The rep said the furniture dealer has to send in a special request to the DH manufacturer (which is in North Carolina) for fire retardant free cushions and that there may be a charge for it. She also sent a link about the foam supplier, but that concerned me a little bit since I thought there was no foam in the cushions. I hope they’re not down-wrapped. I may call the foam supplier and try to get more information on this. I called the store here in Atlanta after that, and the sales rep told me that they are sending in the special request stating that I want no flame retardants in the cushions or fabric. She said my paperwork would state this as well. We’ll see what happens (I’m still nervous though.) I’m not sure if they sell furniture in California, but they probably do as my order is being treated as a special request. I will write back if I find out anything new. Again, I really appreciate your reply and your website! P.S. Please feel free to post this in the blog comments too. I’m just not very blog savvy! I wanted to send an update about Drexel Heritage in case anyone wants to order furniture from them. Since my last note, I’ve had quite a bit of correspondence with the DH Customer Service rep and even the foam manufacturer. Both have been very nice and neither hesitated to answer any of my questions. It appears that the standard DH cushions do have foam and fire retardants in them. The foam is wrapped with different options of down blend. The good news is that both the CS rep and the foam manufacturer confirmed that you can order the cushions without flame retardants; you just have to be sure that the sales rep knows the procedure for doing so. My sales rep and her manager have assured me that they have sent the special request form in and will forward the paperwork to me once it’s been processed by the manufacturer. I’m a little disappointed that the cushions have foam in them, but at this point it’s the flame retardants I’m more concerned about. Hope this helps anyone interested in Drexel Heritage. Overall, my experience with them has been very good. I did finally receive an email from Drexel Heritage saying the foam used in the fire retardent free furniture was from Centipur, which you know Heather Stapleton said their website showed there was no gaurantee that it had no flame retardent. I emailed them in December asking if there was any flame retardent in their foam and received no answer. I might try again, I wanted to see something in writing instead of someone just saying it was so over the phone. I am spearheading an effort for my family and several others that want to rid our lives of toxic furniture and floor coverings once and for all. I’ve read extensively about the subject on the web, but I can’t seem to get to the bottom of one question: is vintage furniture a full-proof option for avoiding flame retardants? Since there is no home-testing option, I’m trying to see if there is a specific threshold date where flame retardants were not commonly used. I’ve seen people say things like pre-1975, pre-1970, pre-1960, etc. furniture should be fine as long as the cushions/stuffing was not replaced after the threshold date. I know that there are no guarantees, but I’m curious if you’ve gotten any legit data on this in your own research of the topic. Thanks for your work on this important topic and for helping more of us understand the issues and options. My reply: Thanks so much for writing. I do try to respond to every question I get through the site or email. My source for the answer to this question is Heather Stapleton, who kindly allowed me an interview last spring (which you can read here: https://laurasrules.org/2012/04/15/sofa-saga-part-3-interview-with-flame-retardants-expert-heather-stapleton/). She is an expert who has studied flame retardants for many years. According to her, pre-1975 furniture is generally lacking in flame retardants. Some furniture after that point may also be, but it is very hard to know what’s safe, especially with older items. Personally, I have used this cut-off. On Craigslist, I found a mid-century modern upholstered chair in mint condition, and an Italian (imported) leather chair that is at least 20 years old (since it was made in Italy, I felt I didn’t have to go all the way back). I can’t thank you enough for all your research on this. I was in the midst of my own frustrating research on couches when I happened upon your blog. I knew I had big, expensive dreams– I just never thought they included a couch! I’ve been in touch with Ken at Eco Select and I am hopeful that we’ll find a sofa that works for us and doesn’t break the bank. So just FYI, I just received two sofas and a nice big leather ottoman from Eco Select and I love them! I would attach a picture but not sure how. The ottoman is not shown on his website, he made to order (I wanted it nice and big so everyone on the two sofas could put their feet up) and it is beautiful! Looks Pottery Barnish and was Pottery Barn price I felt. He also can make any chair into a recliner, which is also not advertised. I could not afford to do all leather (and I don’t really like that look anyway) so sofas are fabric. Anyway, I am very pleased. Sofas are very comfortable and feel very sturdy. Hope that helps. Furniture comes with statement that there is no fire retardant. I trust Ken and had a very positive experience working with him. Thanks so much for the info! It is really helpful to hear from someone who has had experience with the company. First off, thanks for the amazing toxic couch saga! Having (finally) finished my M.S. in mechanical engineering in April and getting a regular job and my own apartment, I was in the market for a couch when I happened upon your blog. The info here stopped my search cold, and I’ve been doing without a sofa until I could make up my mind what to do. I’m glad you were able to find a satisfactory (and hopefully comfortable!) solution to your dilemma. I, meanwhile, am still deliberating. One option is to just go for a cheap, regular couch that I can sell someday when I move into a real house and start a family. (If it’s just me, an adult, using the couch in the meantime, the toxicity shouldn’t be as big an issue.) I would then feel more justified in putting down the serious cash for a good, non-toxic option. Yesterday, using my Google-fu, I came across another option, and I’m wondering if you had ever encountered it (and, if so, what your thoughts on it are). It’s a handout compiled by Green Science Policy Institute (founded by Arlene Blum) that presents options for purchasing flame retardant-free furniture. You can find it here: (http://blog.greensciencepolicy.org/wp-content/uploads/2012/11/FlameRetardantFreeCouches.pdf). A furniture store in my town carries some models made by Corinthian, which is on the handout’s list. I talked with one of the salespeople there, who ended up having to call their purchaser at HQ. The purchaser told her that, since TB117 was a California requirement and this store is in New Mexico, none of the couches on the floor there had flame retardants. (Apparently, having those added costs them extra.) A look at the tag on a Corinthian couch in their store showed no sign of the TB117 statement. However, couches in the same store but from other brands did have the statement. While the purchaser may not have been completely on the mark, it does appear that they (and the handout) were correct regarding the Corinthian models. On Corinthian, the issue with all of these suppliers is really whether you trust them, as with basically anything. They are bound, of course, by truth in advertising rules, but beyond that, it’s really about whether anything smells funny to you about their assurances. From what you’ve said, it seems credible. I’ll also mention that Eco-Select in North Carolina does sell affordable options that are no more than typical furniture in cost, but free of flame retardants. I ordered from Robert because I liked the style of his offerings (given the money I spent even with his discount, I wanted it to look spendy!). However, the sofas from Ecobalanza or other sources also look nice, and Ecoselect’s got great options as well, for a lower price. In terms of mattresses, there are several sources for these in the Eco-stores links at the right-hand side of the blog. White Lotus and other places are nice, and a little comparison shopping can get you a queen mattress with green credentials for around 2K, to give you an idea. In terms of flame retardants, the federal mattress standard means that chemicals are insufficient to meet the standards, so manufacturers used layered materials and boric acid to meet the standards. That means that the chemicals on furniture are not in mattresses, though they do off-gas other things, including proprietary plastics. For that reason, I’m not sure the cover makes sense — why add more plastics? In terms of pots and pans, I like enameled cookware like La Creuset, plain stainless steel pots and pans, cookie sheets, etc., and glass bakeware. I don’t use non-stick pans or appliances (see this post for why: https://laurasrules.org/2012/04/17/my-troubles-with-teflon/) and avoid plastics where I can. Hope that helps! Let me know if you have further questions!! Laura– thanks for the info! I will check out the companies, and hopefully I will make good choices. It’s hard to shop for major things without seeing them in person. Your blog and answers are really helpful. I’m so glad you are looking into these things and sharing your knowledge! thank you again! Anna, I love the couch! What a relief it must be to have that now. Thanks for documenting your experience. As extensive as the whole flame retardant issue is, there seems to be hardly any information about alternatives to avoid them. Obviously that is just a sad reminder of how few alternatives there actually are. I am a stay-at-home mom and my husband works two jobs. Since we have little money to spare, I have tried to put the flame retardants in our furniture in the back of my mind once I stubbled upon this startling issue several years ago. I tried doing everything else we could to make our home safe (earthweave rug and natural rubber gripper, plants, natural cleaning products, organic food, safe toys, safe crib mattresses, etc). However, it just bothers me everytime I look at the furniture, and everytime my girls snuggle up on the couch, or I nurse sitting in the chair (which I think I have spent 75% of the last 3 years doing : ). So maybe I will contact Robert and see what the least expensive option could be. Any suggestions about a chair? The only thing I can come up with is a wooden or unupholstered chair with chair pads and blankets. I am still struggling with a wooden rocking chair that is actually comfortable to rock and nurse my little one in before bed. I have had a hard time finding them with the back high enough for my to rest my head on. Lastly, I asked you before about pillow and chair pad options. You mentioned you went through Etsy and had some made for you. i wanted to pass along this link. My Mom found it and I emailed them asking if the chair pad contained chemical flame retardants. They replied very quickly saying sorry it did not contain chemical flame retardants. So this may also be an option. As with any company though, I would suggest if someone is thinking of purchasing something that they ask the question again before buying anything, because you may get a different answer than I did. I obviously have trust issues with companies now! Hi Meg, With the rocking chair, I used one of those high backed wooden gliders with a custom cushion and a glider foot rest. I went through Etsy for the cushions and picked the fabric myself. In terms of other options, you could look at vintage furniture, which made be cheaper. Pre-1975 is best. You could also check with Eco-select, which is cheaper by a considerable amount. And Ross Endicott, of Endicott furnishings in Maine, has also been posting in the comments that they have options without FRs. Hope that helps — and all sympathies for your situation! It’s so hard!!! Laura — your blog is a godsend. I literally just spent about 5 hours reading through everything you’ve got posted here. I’m in Austin, TX and struggling to find something that I can afford OR can be shipped here. Have you run across any TX companies that are flame-retardant free? I’m going to be investigating Endicott and Robert Craymer. THANK YOU for all that you’ve done on this! HI, the couch looks great! I would like a similar one. How do you know that there is no flame retardant added to the polyester when the polyester batting was made? I would like to use polyester batting also, but am never sure of its contents since there is no ingredient list. On another note, I bought a nitro preethi mixie after reading about it on your site. I am happy with it so far, using it for a month or so. There is a little tiny bit plastic inside of some of the bowls but it is mostly stainless steel that makes contact with the food. Thanks for the idea. Hi Anna, On the mixer, that’s great to hear! We love to make chutneys (coconut, peanut) with ours as well. I do believe I asked Robert about the polyester, but it was so long ago, I’m not 100 percent sure. I’ll ask him again. Heather Stapleton, the flame retardants expert, did tell me that most polyester is not an issue with regards to flame retardants. You could also always go with latex instead. Actually, the original post said “polyester,” but the foam is polyurethane, which is free of FRs, and that’s what is in the pillows as well. Sorry for the confusion! It’s gorgeous! I’m glad that you have your soft place to land, knowing that it has not been easy. Thanks for taking this whole issue to the curb and helping make sense – or understand the nonsense of it all. That’s great!! What is the normal charge for a couch like this by Robert? Hi Kristy, Please be aware that some readers have written me with quality and other concerns about his process and products. Our sofa has been fine. I didn’t use or order the latex. Hi Laura. Thank you for your reply. Robert Craymer is in the process of making some furniture for me right now. I am looking forward to enjoying it just as you have.